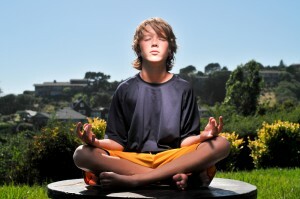 For the past couple of weeks, I’ve talked about the growing trend of teaching children to meditate. Not too long ago, many of us thought meditation was exclusively a grownup pursuit, but that old paradigm is being shattered as more and more adults teach their children how to meditate. It turns out that children benefit from meditation just as much as adults do – some could even argue more so. However, how does one go about teaching their children how to meditate? Start small and focus on the moment: Meditation can be challenging for adults, so you want to keep it as simple as possible when you first start teaching it to your children. Start with a basic focused breathing technique to show your children just how easy it is to zone in on the here and now. By simply having them pay attention to their breathing, they will learn to focus on the moment. Don’t be a control freak: It’s not easy to get a child to do something, and meditation is no exception to the rule. For example, you might tell your child to close their eyes, but they just can’t keep them shut. Instead of being hung up on the fact that they won’t keep their eyes closed, give them something else to look at or focus on. Maybe you instruct your child to sit with their legs crossed, but they complain it’s uncomfortable. That’s fine. Let it go. In other words, bend the rules if you need to. Have immense patience: Before you even delve in to this endeavor, know that it is going to take a long time. Keep the goals you set for your children small and simple; and if they don’t meet them, don’t freak out. Get creative: You might have a specific way you go about meditating that your child finds utterly boring and uninteresting. If this is the case, you’ll have to use your imagination and come up with new ways to make meditation more fun and interesting. Practice what you preach: Don’t just tell your children how to meditate, and then stand there watching them; do it with them. Also, make sure you get feedback from them after each session. You never know, you – or they – might teach yourself a new thing or two in the process.